Growing up in a home with a low-flow toilet and very vigilant parents who were adamant on not clogging the toilet–well, you can bet that I am now conscious about clogs in my own home. Having two kids who love to roll toilet paper many times over and then sometimes proceeding to flush it down the toilet, that just screams potential clogs. Nobody knows clogs better than Tammy Buchanan! She is a plumber, founder of Small Jobs Plumbing– the first female owned and operated plumbing company in Nova Scotia and mother to an eight-year-old boy. One of her top tips for avoiding plumbing problems is starting with a toilet paper that breaks down quickly in water. This is especially true if you have low-flow toilets or a septic system, own a cottage or RV or simply have a kid who can’t help but put a little too much in the bowl! When I was invited to take the MAJESTA e•z flush Test, I was intrigued and quite interested. 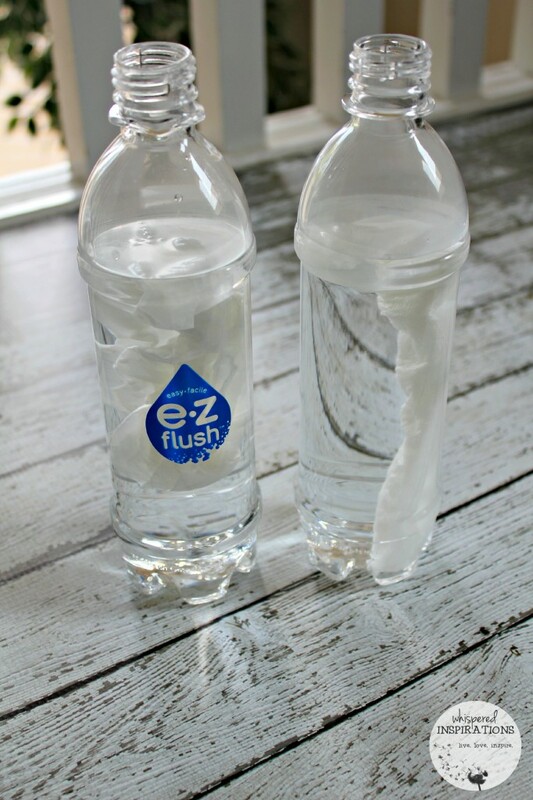 A toilet paper that breaks down easily in water and one that can be flushed? Unheard of for me! I was more than up for the challenge and decided to test MAJESTA against the very strong and durable leading brand I use. 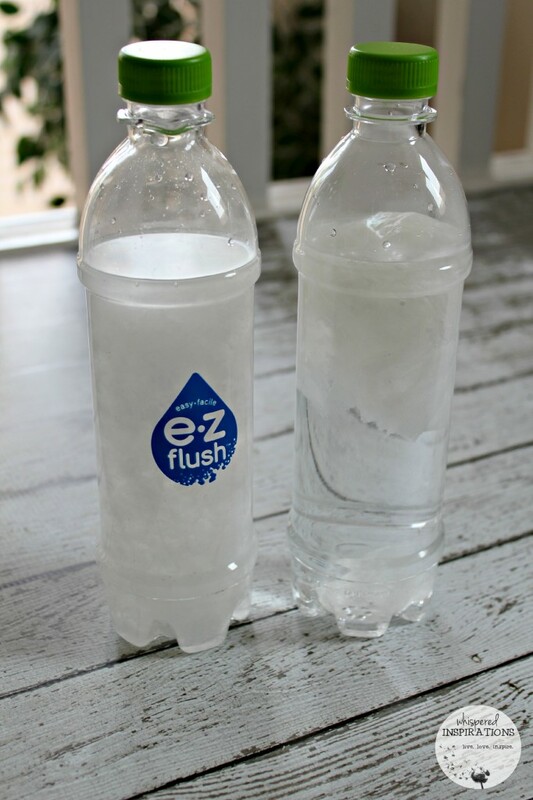 The challenge is quite simple, you take 5 squares of the leading brand of toilet tissue and 5 squares of MAJESTA e•z flush toilet tissue, put them in bottles and shake. The results will astound you and if you are so inclined, maybe you can try it too. I think you will be pleasantly surprised with the results! 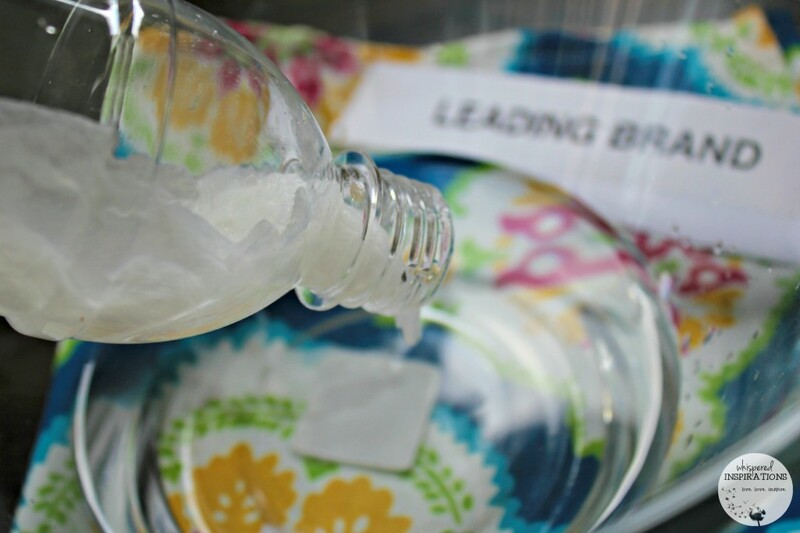 Fill the bottles up with water, I used regular tap water at a cool temperature. 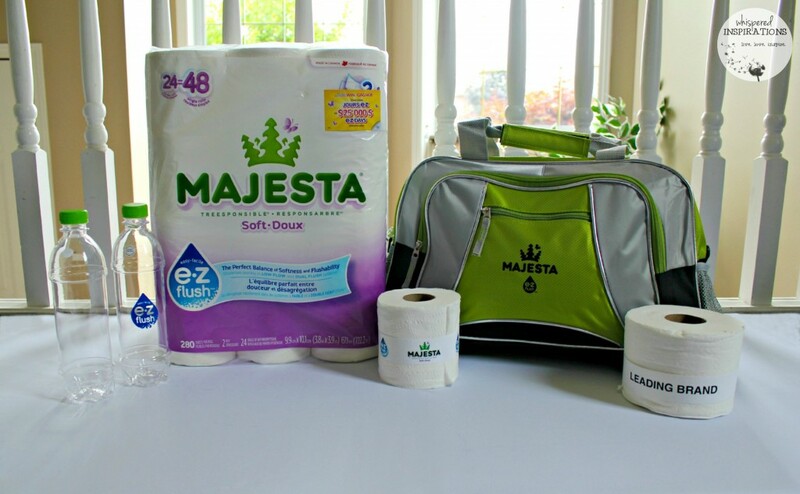 I took 5 squares of the MAJESTA e•z flush toilet tissues, folded it into the MAJESTA e•z flush bottle. I did the same for the leading brand and secured the bottles tightly. I shook for about 15 seconds simultaneously. MAJESTA e•z flush Test WINS! 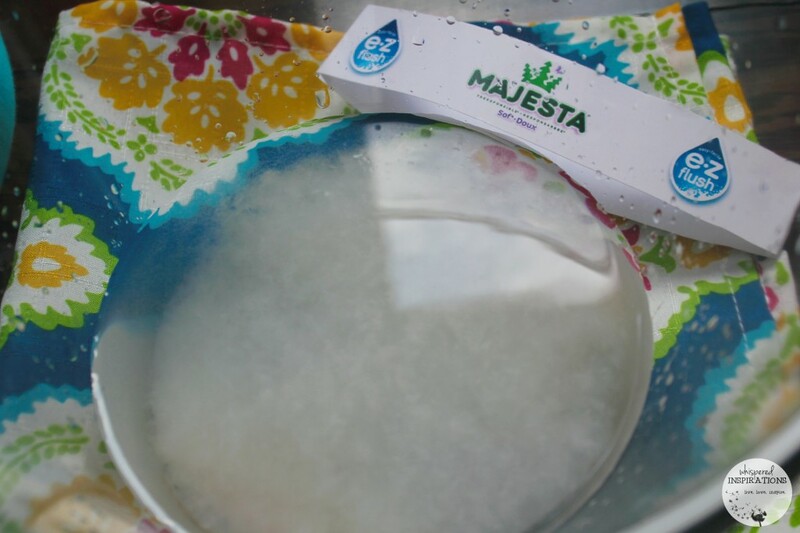 I poured out the contents of the MAJESTA toilet tissue and water into a clear bowl. The entire contents came pouring out and the toilet paper had completely disintegrated. No more solids, just soft, cloudy remnants of the toilet tissue. This is amazing! Knowing that this happens when we flush our tissue makes me very happy. The proof is in the pudding folks! Leading Brand, Down for The Count? 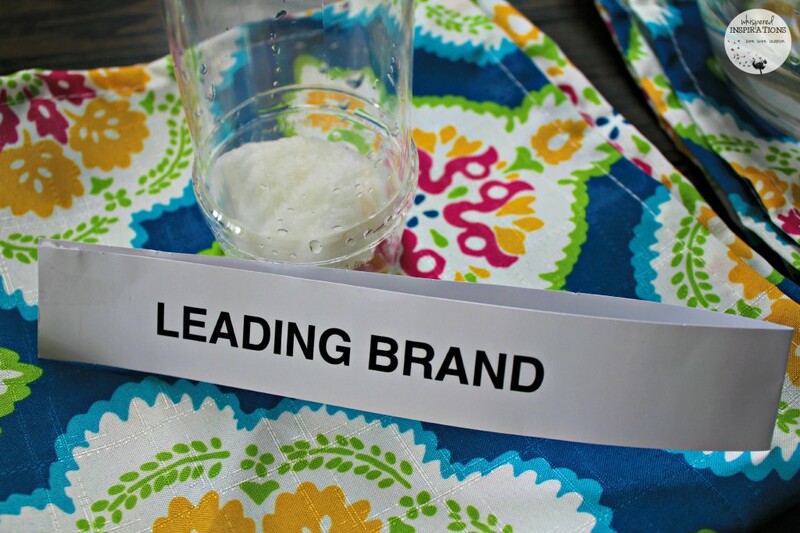 The leading brand didn’t fare so well when it came to the shake test. 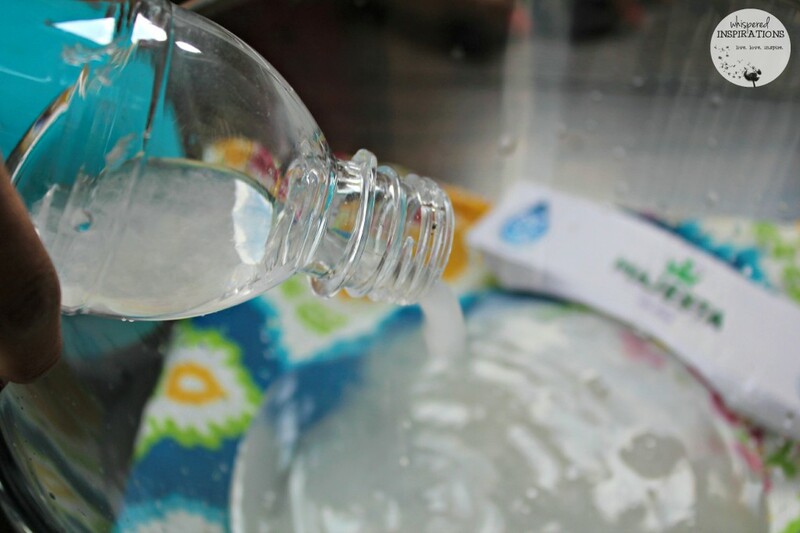 It remained intact and after being shaken, the contents were poured and the water poured out. Except when the big wad of toilet tissue blocked the flow and did not come out of the bottle. It had now broken down at all. I was pleasantly surprised because these results are telling. 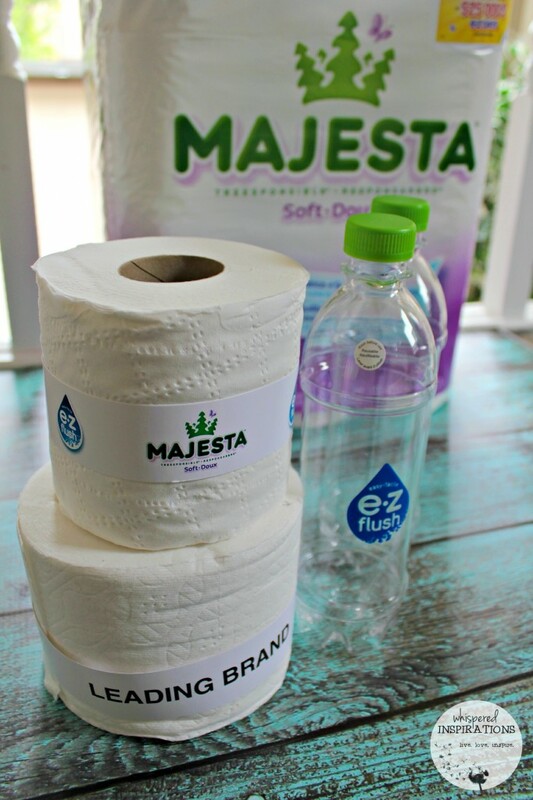 MAJESTA e•z flush toilet tissue is soft, durable and I am shocked that it breaks down so easily when it faces the flush. I am sold! If that’s not enough proof, Gabby, one of my toilet tissue excessive rollers put it to the test! 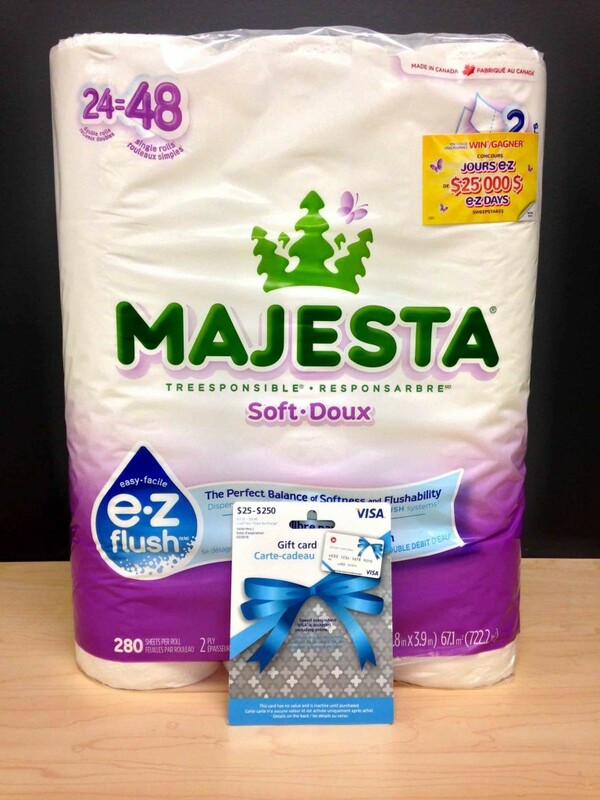 You can see how both the MAJESTA e•z flush and leading brand toilet tissue fare in real-time! You will love the MAJESTA e•z flush Test. The MAJESTA $25, 000 e•z Days Sweeps! It is running for 365 days and you’ll have the chance to win daily MAJESTA product prize packs, two $50 cash prizes every month and five grand prizes of a $3,000 shopping spree. Check out more info about the MAJESTA $25,000 e•z Days Sweepstakes! The Sweepstakes is open to Canadians and ends December 31st, 2014! One lucky Whispered Inspirations’ reader will win a $40 MAJESTA prize pack and a $25 Visa Gift Card! 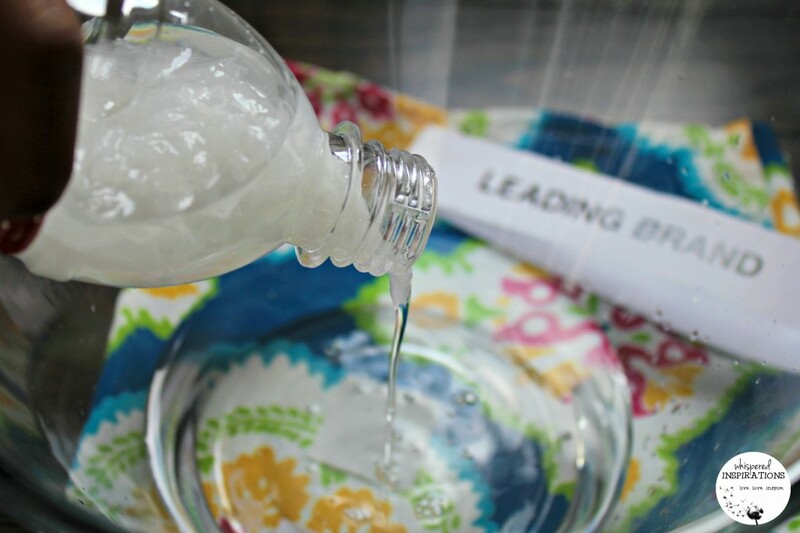 Now you can put it to the test and no longer worry about clogs! This contest opens on August 14th, 2014 and ends on August 30th, 2014! Do you have any clogging toilet issues in your home? Haven't had any since living here for 6 years. Hope not to have any in the future. Yes I have plumbing issues. Nope no issues..knock on wood! No TP clogging issues so far!! That is great, with MAJESTA, you can be proactive! Yes, my sons have a tendency to use too much toilet paper. And clogs are not fun. Sometimes we do..hair clogs..my husband throws it in the toilet..no matter how many times I tell him not to! Oh no, that would do it! I don't have very good water pressure so I sometimes have trouble with clogging. This would be perfect for you! We thankfully don't have any toilet-clogging issues at the moment. I haven't had issues of late but it never hurts to be proactive. Yes we have to hold the handle down until all the TP is gone. me too!!! Not sure why that happens,,been happening recently. I don't have issues now that the children are older… but.. hot wheels cars/barbies/pencils/crayons/small dolls/toys… those don't flush well! LOL, oh I feel your pain! Yes, the thicker more expensive tissues clog my toilet. I found this is still pretty thick and just as soft as the leading brand. My kids love to use tons too! YES I DO. OUR CURRENT BRAND OF TOILET PAPER IS CLOGGING OUR TOILET CONSTANTLY!! Oh no, maybe you should try MAJESTA! no we havent thank goodness! Oh yes! My boys have clogged and overflowed the toilet several times. It makes for the worst day! Our plumbing backed up the other week! We had to get the septic tank pumped out. My kids sometimes use a little to much toilet paper, that's are only problem with the toilet. Yes I will admit, ! I am over zealous with the toilet paper. Fortunately, at this moment I do not have any flushing issues because I keep an eye on my kids. However I have had some close calls with my 5 year old putting too much in the toilet. We haven't had issues flushing, yet, but I know our pipes are severely clogged. Our sink doesn't drain well, no matter how many times it's snaked, I'm sure the toilet doesn't help any. Yes we do. Sometimes we have to flush 3 times. I am really intrigued by this. We have clogs often in our house and this may eliminate them. My recent post It’s a new school year and I have 2 attending! I wish I had this toilet paper years ago when we were living in a house with a septic tank and low flow toilets. Clogs were such a problem! My kids are the worst about clogging toilets! We need all tp to be just like Majesta! This is good to know. WE have to watch what goes into our pipes. Oh wow! I've never used this brand but that looks like a GREAT reason to! I had never heard of Majesta until now. My kids are the SAME way with toilet paper so I'll be checking this out for sure. LOL, you will be more at peace if you do! Wow, the results look great! I hadn't heard of Majesta until now, I will definitely be looking for it next time I go shopping! Once in a while when my daughter gets carried away with the tp! sigh. We have low flow toilets and 1 son who uses too much toilet paper so I have to say that occasionally we do have clogging issues. This might be a solution for the main bathroom that he tends to frequent. I think it may be! This is a really interesting test! I would have never thought of trying that on my own! Thanks for the info and giveaway! yes,I have had a few toilet clogging issues in my home!!!!! Nothing lately…hopefully it won’t clog anymore. Not unless it's hubby, ha ha ha! No so far we have been very lucky, no clogs! No, thankfully we don't have any toilet clogging issues. yes, it is due to one of my kids…. Nope – lucky we have not encountered any! No, but we used to at our old house! Fortunately no we have not had any clogging issues yet! We sometimes have clogging issues, yes. No, we put in a top of the line toilet. Just got an energy efficient toilet – with 1/2 the water than the standard. Saves $ with the less use of water but at times can be a real nuisance when too much toilet paper is used. Just one kid that uses too much paper! Not in our current home but our last home we had to use a snake quite often. yuck! No we don't have any plumbing issues. For some reason, whenever my FIL visits, we seem to be always trying to find the plunger. Not sure why :). No , not usually . We do have troubles with clogs occasionally due to old plumbing! From time to time due to kids. Sometimes when my boy uses too much. We used to have until we have to change the toilet. My husband picked the one that supposedly can flush 30 golf balls at a time! Always, esp. with the 3 ply…just too thick and soft! yes for some reason the upstairs toilet (even though it is only a year old) always gives us trouble. No, we haven't had any issues lately. Yes, we've had a few clogging issues when the water pressure was low. No but my mother in law does almost daily! The toilette upstairs is a bit sensitive! Not all the time but it has definitely happened before. I always have clogging issues at home! I toilet gets clogged once in a while!